Team: 2 | Duration: 3 weeks | Read time: 7 min. Airports are bustling environments where all kinds of people go to travel from one place to another. The traveler’s most crucial information lies on his plane ticket and hence the ticket needs to be designed in a manner in which all kinds of people can understand the details it presents. The current Delta ticket has all the information but does not present it in a clear and consistent manner. I worked as Co-UX Designer on this project with my teammate and my role involved design ideation, user research, sketching, prototyping, visual design and communication of the ideas. 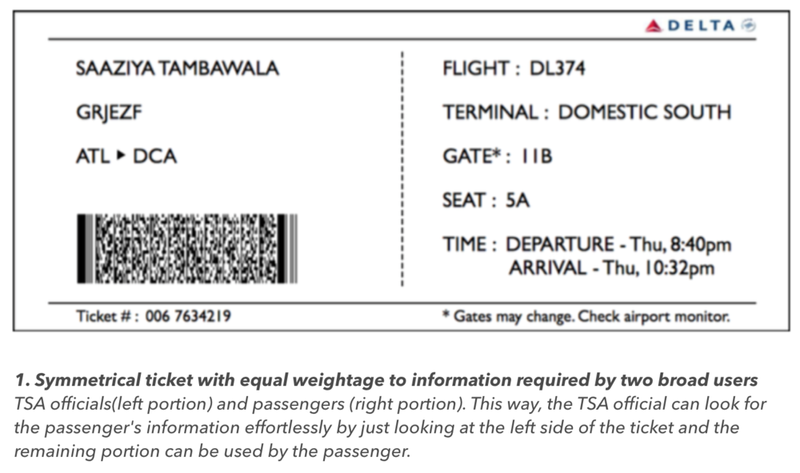 We started off by looking at current and previous versions of the Delta ticket and listing down the different elements of information that compose the ticket (Time, source, destination, personal details, barcode etc.). They were approximately 15 in number. Consultant at Deloitte: Andy is an IT Risk Analyst at Deloitte who leads the typical consultant life, traveling weekly for work from Atlanta to New York and back. Being a frequent flyer, he likes to show up just in time at the airport and travels light with just one carry on. He is well versed with the check in procedure and is most concerned about the boarding time. International student: Sonam is travelling to Atlanta for her graduate studies. This is her first time flying solo on an international flight. She is extremely well prepared and has planned her travel weeks in advance. For her flight she would like the boarding pass to give a step-by-step guidance. Elderly professor with poor vision: Dr. Daniel is a professor at Georgia Tech who is travelling to San Fransisco for a conference. He has poor vision and often has trouble finding important details on his ticket. He is not new to travel but would want all the details to be listed in bold and big font for easy reading. Flight official: Hannah is a check-in attendant who performs the repetitive task of verifying passengers’ information. She has 5 years of experience and knows exactly where to find the details she’s looking for. After understanding the range of users that use air tickets, we had an intense brainstorming session, fueled with tea, coffee, post-it notes and snacks and came up with about 10 concepts for the re-design. These ideas ranged from enhancements to the existing form, alternate uses (e.g.bookmark) to product designs (e.g. keychain). We conducted quick brainstorming and sketching sessions during which we came up with an array of design possibilities. The sketches contained features that focused on making the most relevant information more prominent, making it easy for both the traveler and officials to read the ticket, keeping the size as convenient as possible and thinking outside the box in terms of form factor of the ticket. After the first round of presentations and in-class critiques, we decided to refine some of our ideas and came up with 4 final designs for the second phase. After yet another round of critiquing, we noticed some loopholes in our existing designs such as lack of authority of certain elements over others (no heirarchy) and how the sticky part of the arm band might get stuck to peoples hair and prove to be inconvenient in the long run cost-wise. We finally decided to pursue the bookmark idea so that passengers could keep these tickets as personalized soveniers rather than just another piece of paper. Our goal was to provide authority/veracity to the display of information. We did this by demarcating a separate shape and color to the flight related information while also keeping purely visual elements like the border in tact so that the artifact could serve as a personalized souvenir.